Abstract：With corn oil samples including crude oil, degummed oil, dewaxed oil, bleached oil and deodorized oil from production line of super degumming combined with pre-bleaching-re-bleaching, deodorization and deacidfication using twin towers as research subjects, the contents of free fatty acid, phosphorus, metal ions, pigment and tocopherol, and peroxide value were determined in order to investigate the effects of refining process on trace components in corn oil. The results showed that free fatty acid content decreased obviously after deodorization and deacidification using twin towers. about 95% phospholipids were removed after super degumming. The contents of metal ions decreased obviously after degumming and bleaching. Most pigment was removed after bleaching. 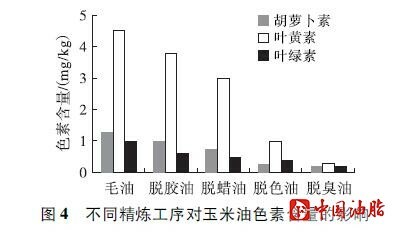 After deodorization, 19.9% tocopherol was lost. 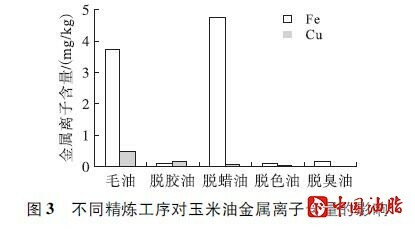 The peroxide value increased after degumming, but it significantly decreased after deodorization and bleaching. Therefore, suitable refining process should be selected according to the quality of crude oil. In this way, benefit minor compounds could be reserved, simultaneously, harmful minor compounds were removed, and moderate refining was achieved. \[2\] HORNERO-MENDEZ D, GANDUL-ROJAS B, MINGUEZ-MOSQDUERA M I. Routine and sensitive SPE-HPLC method for quantitative determination of pheophytin a and pyropheophytin a in olive oils\[J\]. Food Res Int, 2005,38:1067-1072. \[3\] 张华, 杨鑫, 马莺, 等. 固相萃取-反相高效液相色谱法同时测定饲料中的角黄素和虾青素\[J\]. 色谱,2008,26(3):392-394. \[4\] 邓春梅, 姚鹏, 刘淑霞, 等. 海洋浮游藻色素分析和化学分类研究进展\[J\]. 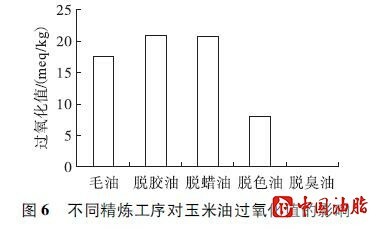 中国海洋大学学报（自然科学版）, 2010,40(4):91-98. \[6\] 金青哲,谢丹,张余权,等. 精炼过程中微量成分的消长及其对食用油稳态化的影响\[J\].中国油脂, 2011, 36(6):21-24. \[9\] 孟橘,倪芳妍,杨帆,等. 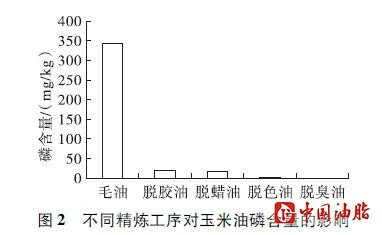 油脂加工过程中重金属危害的研究 \[J\]. 中国油脂, 2008, 33(1):16-19. \[10\] 金青哲. The study on trace components in corn oil \[C\]// Book of Abstracts of 14th ICC Cereal and Bread Congress and Forum on Fats and Oils. 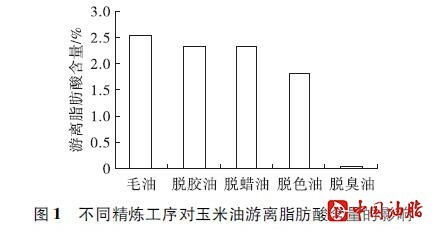 北京: 中国粮油学会,国际谷物科技协会, 2012:66-68. \[13\] WEISLER L. Conversion of beta, gamma, and delta-tocopherol to alpha-tocopherol by aminoalkylation and reduction：US2519863\[P\].1950-08-22. \[14\] 刘宾. 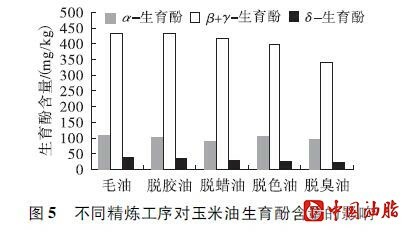 玉米γ-生育酚甲基转移酶基因的分离及其功能分析\[D\].河北 保定：河北大学, 2007.